...of the Antarctic ozone hole since launching aboard NASA’s Suomi National Polar-orbiting Partnership (NPP) satellite on Oct. 28, 2011. According to NASA and NOAA, the 2012 satellite measurement map of the Antarctic ozone hole shows that it is the second-smallest in 20 years since it appeared in the early 1980s. This is the first year Ball’s OMPS instrument is providing the ozone data, continuing a satellite record dating from the early 1970s. 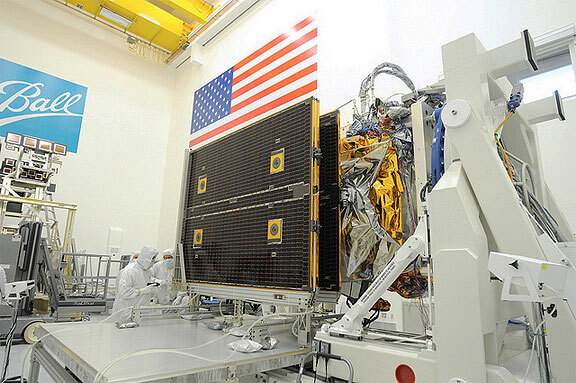 Under contract to NASA, Ball Aerospace designed and built OMPS and the Suomi NPP satellite, and integrated all five of the satellite’s instruments. Suomi NPP orbits the Earth every 102 minutes, and to date has completed 5,000 orbits capturing data from the Earth’s land, oceans and atmosphere. Currently, Ball is building Suomi NPP’s successor, the Joint Polar Satellite System-1 (JPSS-1) satellite and its OMPS instrument, to maintain continuity of weather and environmental observations into the 2030s by providing a daily map of the entire globe’s ozone. Ball’s OMPS instrument measures atmospheric ozone and how ozone concentration varies with altitude. The three-part instrument includes a nadir profiler, to help scientists better understand ozone destruction in the middle and upper stratosphere; a limb profiler, to discern lower stratospheric ozone variations; and a nadir mapper to analyze daily global total ozone maps. Ball’s OMPS is based on its previous instrument, the Solar Backscatter Ultraviolet instrument (SBUV/2).